One of the sure signs that spring has arrived is when the beautiful yellow forsythia bushes begin blooming throughout the neighborhood. The bright cheery color makes me think of warmer weather that is on it's way. You don't have to wait for them to blossom outside to enjoy the beauty, though. 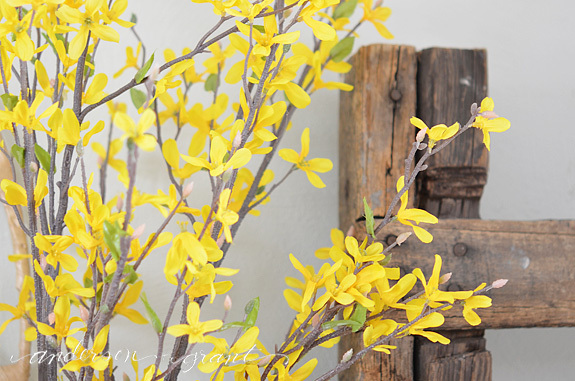 Forsythia is one of the easiest flowering branches to force to bloom inside the house during the colder months. Flowering trees and shrubs set their buds for the following year after dropping their leaves in the fall. They need a proper cold period of between 6 to 8 weeks in dormancy before they are ready to be brought indoors to bloom. In many areas, this means that they can be pruned from the bushes as early as January. I'm a bit late with this post for many of you in warmer climates. But because of the extremely cold winter, the bushes in my area are not close to blooming yet so it is still possible to force them indoors. They will actually blossom faster now than if they were cut in the dead of winter. The length of time it takes for them to bloom depends a lot on how close it is to their normal blooming period. Add the branches to water that so warm that it is almost hot. The warm water opens the pores of the branch and allows it to draw in the water much faster. Be sure that any blossoms that are under the level of the water are removed. Typically it will take about two weeks until they are in full bloom. 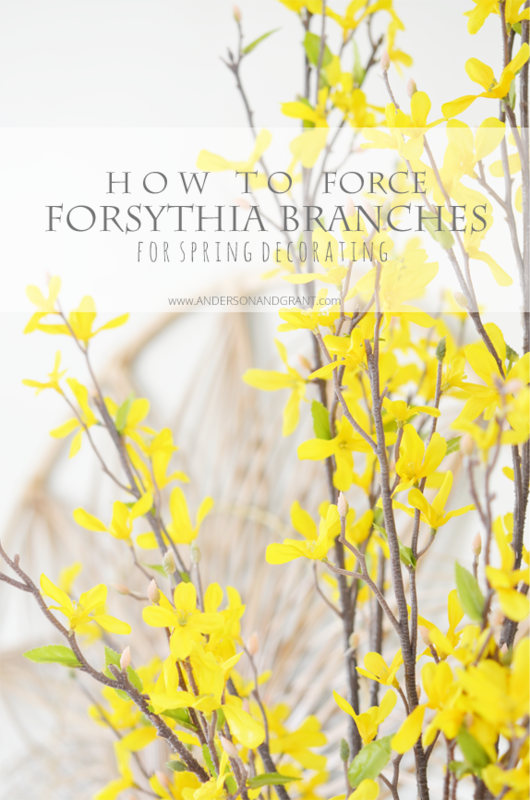 The flowering forsythia branches can last up to three weeks if they are in a room that is not too warm and stay out of direct sunlight. Changing the water regularly also helps for the flowers to stay intact. This is such an easy and inexpensive way to bring a little pop of color and spring into your home. I'm on my way out to gather some branches right now. Is this a trick that you've tried in the past?